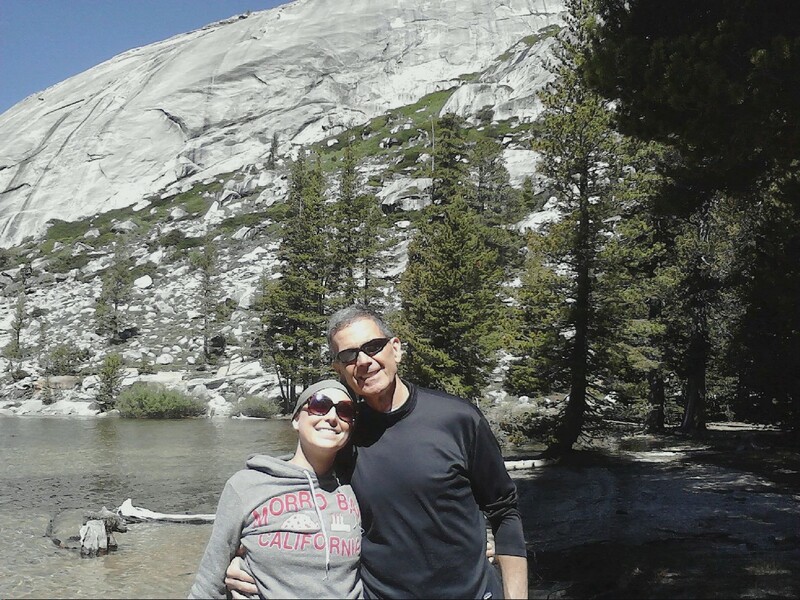 It is Dr. Dad's habit to make a weekly pilgrimage to Yosemite. Each weekend he'll get up at the crack of dawn and drive three hours to get there, push himself up and down a rock slab for six hours or so, and then drive home. He enjoys triple soy lattes in each direction. It is a ritual that makes him happy and refreshes his soul. Last weekend was the time between my chemo cycles when my white blood cell count gets low. In cancer-speak, it's my time of being "neutropenic," and it means I'm more susceptible to infection than usual. After some deliberation, Annie and I decided that a camping trip would probably be pushing our luck a little too much, given the general sort of filthiness one accumulates in a weekend of hanging out in the dirt with no shower. Again, I'm not accustomed to caring about germs, but definitely don't want any complications to delay the rest of my chemo treatments or stem-cell procedure. So. Camping was out. But how much harm could one day in Yosemite do? Fresh mountain air, a crisp cool stream, it would do more for my health than another day breathing the Visalia smog. Right? Right. Dr. Dad seemed happy that we were interested in joining him. 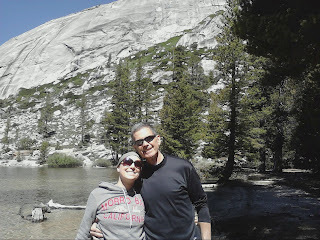 He even upped the ante, suggesting that we drive an hour past Yosemite Valley, to another place he likes to climb called Tuolumne Meadows. But would there be a lake or a stream next to which we could unfold our backpack chairs and chill out to the max? Also, a word about the backpack chairs. You may notice that they are featured in many of our outings. I cannot speak highly enough about this purchase. First, obviously, you can wear them like a backpack, which makes them incredibly easy to carry to lounging places off the beaten path. They also have a pouch on the back, making for easy storage and transportation of towels, water bottles, books, snacks, bug repellent, and more. They have a headrest. They have a cup holder. They are awesome. They take us places we've never been before. I'll never make another outing without 'em. 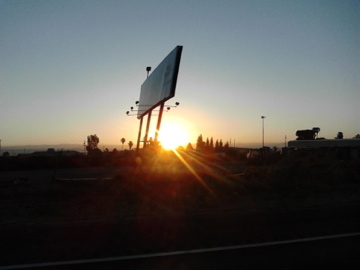 We got up just before sunrise (see photo) and hit the road. We were two and a half hours into the drive, sipping our soy lattes and rolling past the golden foothills that Dr. Dad refers to as "Steinbeck country" when I realized I'd forgotten my Neupogen shot for the day. And I'd forgotten to do one the day before. (Neupogen is the medicine they give me to increase white blood cell counts. I usually get a shot every day during my first week out of the hospital, and they're especially important on the days I'm neutropenic. Of course.) On weekdays I go to the cancer center to get my shots, but on Fridays they'll give me a couple to take home for the weekend. It's become a usual practice, and this is the first time I've ever forgotten to do it. My first instinct was not to say anything. We all know how serious Dr. Dad is about me not putting myself at risk for infection. How could I tell him I'd forgotten two days worth of infection-preventing shots? "I just realized something, and nobody's going to like it," I announced. "I forgot to do my shot yesterday, and we didn't do it this morning either." Dr. Dad almost turned the car around right then and there. Man, was he pissed. "I should turn the car around," he said, "to teach you to be responsible." That made me feel like a child, so I started to whine like one. "Pleeeeaaaase, Dad, let's keep on going," I begged. "I'll be fine. I'll be fine! We'll do my shot tonight when we get home. It's only one day really missed. Please!" He pulled over at a gas station so we could call my mom and get her opinion. Mercifully, I finagled her permission to continue, and so we did. I feared Dr. Dad would be angry at me all day long, but his spirits seemed to lift with the elevation. 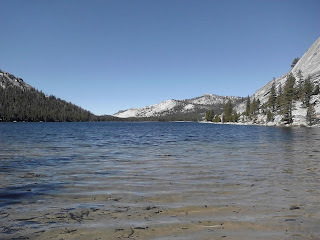 Tenaya Lake turned out to be even more picturesque than we imagined. We arrived around 10 a.m., and found the little beach to be completely deserted. (Alas, it was not to remain that way, but we didn't realize it then). We unfolded the backpack chairs and set them up facing the view you see here. Dr. Dad took off to climb some rocks, and if he hadn't briefly returned with our lunch, we would have been so taken with the view we probably would never have noticed the doe that crept out of the forest to feed on some tufts of grass just behind the beach. She stayed near us for a remarkably long time—I guess the animals in the Yosemite area are pretty used to people at this point—but to see her was still a beautiful treat. "I wouldn't be surprised if I saw a Unicorn right now," said Annie, after the deer had disappeared back into the woods. "Or one of those half-men, half-horse things." "A centaur!" I cackled. But I secretly loved how enchanted she was. By everything. You can see in this photo that I'm wearing a jacket. 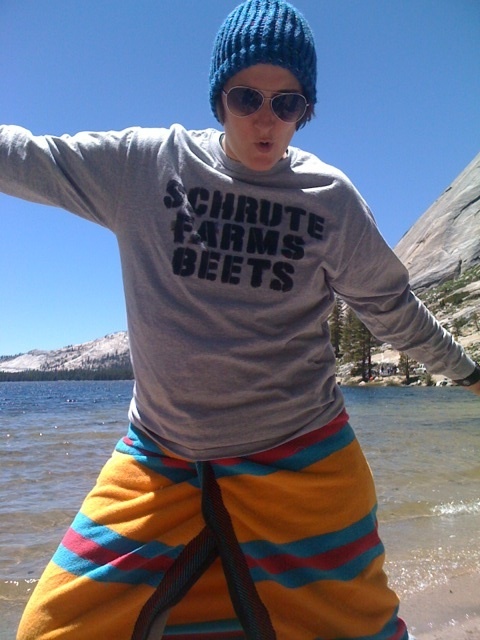 What you can't see is the sweatshirt, long-sleeved shirt and t-shirt I have under it. I'm not sure if you can see the knitted cap and the hoodie-hood underneath the windbreaker hood, but they're there too, as are the wool socks under my Crocs. What you also can't see are the rest of the tourists, running around the beach in tank tops and shorts, wading in the water, and generally behaving like it's summertime. Dr. Dad strikes again! There was a light breeze—or stiff wind, if you ask him—rolling off the lake, and he insisted I'd catch a cold if I didn't bundle up. After having dropped the ball on the Neupogen, I was in no position to argue. And so I spent the day layered like I was on an expedition to Everest, while all the children around me scampered around barefoot. 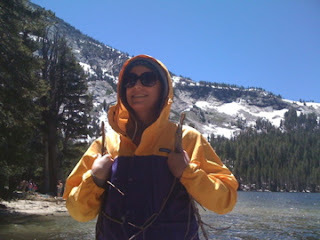 In spite of all the precautions and worry, we had a beautiful and health-problem free day on the lake that day. The only issue we encountered was the family of ten that swooped into our spot in the early afternoon. I guess it would have been smart to stake our claim at the picnic table nearby, but as it we had kept our cooler between our backpack chairs, there was no way to stop them from taking over. They swarmed around us like so many squirrels, and though we tried to co-exist with them at first, it became impossible to ignore the commotion of their many obnoxious teens. We finally ditched the beach and headed off to explore the rocky outcropping at the base of Dr. Dad's climb. It was there that Annie saw her first marmot. It isn't a magical creature from a fantasy legend, and she did think it was a porcupine at first, but it was fun to introduce her to some new wildlife. Eventually she took a liking to the mountain rodent, and decided to call her Maude. I can't overstate how lucky I feel to be able to make all these trips to such beautiful places. I know that many people suffer so much from chemotherapy that road trips and mountain outings are simply impossible. For me, these trips are how I continue to Choose Life. They're what keep me going, what fills up my spirit-tank between hospital stays. 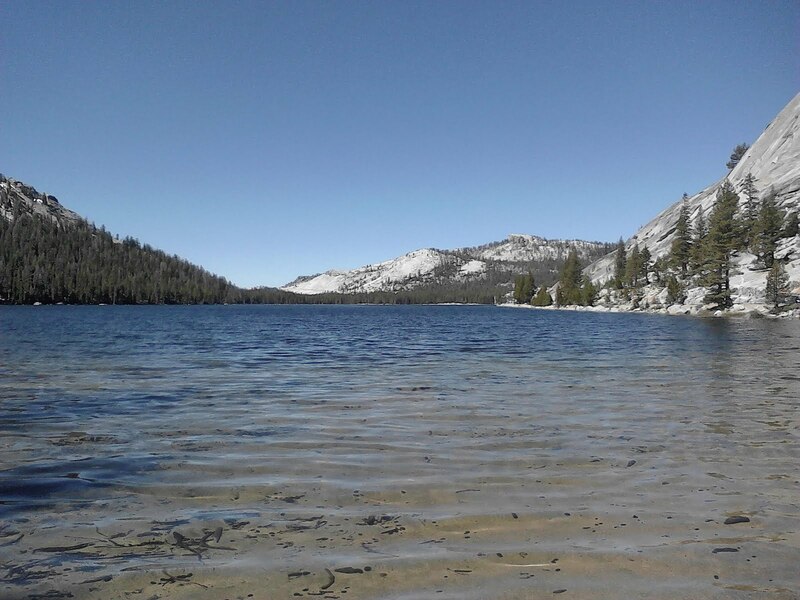 As much as I complain about living in Visalia, the saving grace of the place is that so many other gorgeous locations are accessible within a day's drive. I'm so grateful to be able to take advantage of this, and to suddenly have the time to show Annie the sights and places that make California so special. Until our next adventure, Fo Stage and No Stage would like to continue to send love and thanks to everyone still keeping tabs on us, praying for us, and Choosing Life along with us. Thank you for sharing these lovely journeys! May your unexpectedly long CaliforniCancerCation be filled with many more of them, each of them blessing you, filling you, and healing you!